In a Strange Land: Transhumanism Meets "Sleeper"
I recommend a June 11 feature story worthwhile for its treatment of Transhumanism, the Singularity, immortality, and other ideas I find ridiculous. As a Peak Oiler, I don't think we'll have the luxury of trying to build machines to upload our minds. We'll be busy enough trying to keep the lights on, keep the Internet running because we won't be able to travel much in person, and use electric trains and buses while we scrap our car-based suburbs for building materials and farmland. The meat and all its demands, as William Gibson might have put it, will be our destiny in an age of permanent energy shortages. Throughout "Transcendent Man," Mr. Kurzweil is presented almost as a mystic, sitting in a chair with a shimmering, circular light floating around his head as he explains his philosophy’s basic tenets. During one scene at a beach, he is asked what he’s thinking as he stares out at a beautiful sunset with waves rolling in and wind tussling his hair. Remember the dictator from Woody Allen's 1973 film, Sleeper? He's depicted in a similar way. I can think of any number of better futures, with or without Peak Oil. Kurzweil postulates that with human-computer symbiosis, our species will populate the universe. I, on the other hand, don't think we'll have the spare energy to go back to the Moon, let alone the stars. And if we did find a wonder fuel to replace dwindling supplies of fossil fuels, the ineffably human will remain in our Transhuman selves. Like Gibson put it in Neuromancer, we'll spread our DNA out of Earth's gravity well like an oil slick: an image apt for our current stupidity in the Gulf of Mexico. Nowhere in Transhumanist statements have I encountered the human part of our intellect that can make one a Macbeth instead of a Mother Teresa. Guess what? The Consciousness is already here. And yogis and monks have been tapping into it for thousands of years. But the only way they have found it is by turning away from desires and wishes, and learning to still that hyperactive mind that we each have. Oh, and becoming humble and grateful doesn't hurt, either. The hubris of the Transhumanists to escape what Time's Arrow does to their bodies is, in the end, rather sad, as sad as most attempts to live forever in fact or memory. 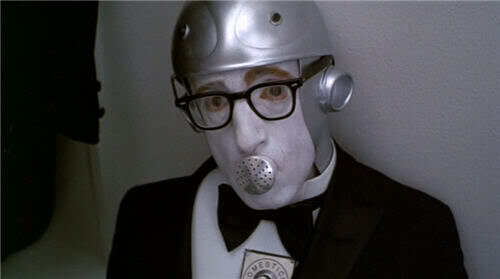 In Sleeper, after an attempt on his life, the leader's nose is saved, at least until Woody Allen's character tosses it under a convenient steam roller. So much for living forever.